Trailed bale chopper/feeder with 4.2m3 loading capacity. 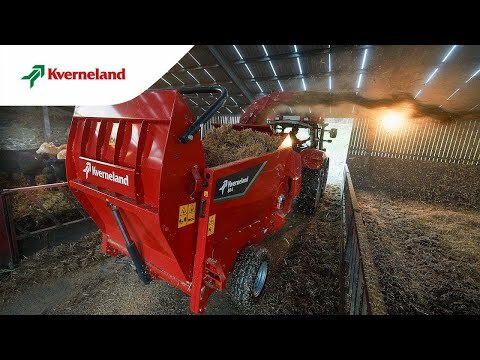 The Kverneland 864 has grown its dimensions in all aspects with a massive 4.2m³ chamber size. It handles 2.1m diameter round bales and its longer body design provides even better support and stability for large square bales. With a completely redesigned drum and flywheel configuration, it offers significantly higher through put and impressive blowing distances of up to 25m. Blowing distance up to 25m. Choice of 3-stage swivelling chute or side chute. Drum Feed Control System - Blockage-free design. Optimised drum, flywheel and chamber design for maximum capacity and throughput. Unique drum-knife configuration to handle a wide variety of materials. Model Cubic Volume Load Capacity Power Req, Min. Designed with a turning radius of 260° which enables easy access to even difficult reachable spaces. The 3-stage movement enhance the feeding perfomance without blockage even on long fibrous material. The Drum Feed Control System (DFCS) is an exclusive feature (patent pending), designed to handle even the most difficult material when feeding. It is a simple and reliable system, which includes a powerful electric cylinder and a comb positioned above the drum. During loading DFCS is engaged, which means that the comb is in a lowered position. This ensures that blockages of the flywheel is minimized during the loading and start up process. The progressive release of the ‘fingers’ offers a more gentle start, protecting the machine and minimizing the risk of blockages. A reliable and simple system with minimum maintenance! The Kverneland 864 features a unique drum – knife configuration. Knives are mounted on angled rings so that they pass a fixed ‘comb’ on alternative sides. This ensures that materials are cut and fed into the flywheel chamber evenly, reducing the risk of blockage, offering even discharge & leaving the drum and comb clean. The drum is fitted with 14 blades as standard, but will accept a further 28 blades according to material type – simply bolt them on in a matter of minutes. A patented system - the knives pass the fixed comb on alternative sides for a more even cut. To provide the correct flywheel speed for bedding and feeding the Kverneland 864 is fitted with a two speed gearbox. At lower speeds the flywheel ensures a metered flow of silage or hay for feeding. At high speed a powerful blow for the most efficient distribution during bedding is ensured. The gearbox speed is adjusted via the handle on the front of the machine. The hydraulically operated rear door fitted to 864 provides a self loading facility for easy loading of square and round bales. Tailgate and floor chain can be operated via the remote control on the side of the machine. The rear door also offers the ability to carry a second round bale for increased capacity. A bale kit can be fitted to the end of the tailgate to ensure that the bales stay in position during operation. The size of the bale chamber makes it very easy to load the material with a loader - and two round bales can be loaded at the same time - saving time.